The Oscar-winning actress led the 82 actress, female producers and directors who marched arm in arm in the unprecedented protest on Friday to demand equal pay and an end to sexual harassment. Blanchett said: "We all face our own unique challenges but we stand together on these steps today as a symbol of our determination and commitment to progress. 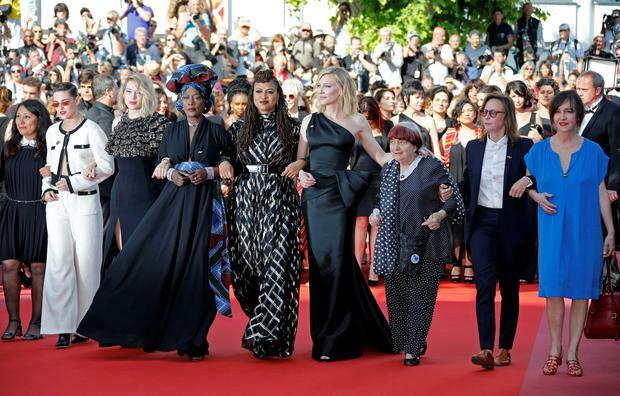 "We are writers, we are producers, we are directors, actresses, cinematographers, talent agents, editors, distributors, sales agents and all of us are involved in the cinematic arts and we stand together in solidarity with women of all industries." Blanchett concluded: "We acknowledge all of the women and men who are standing for change. The stairs of our industry must be accessible to all. Let’s climb."